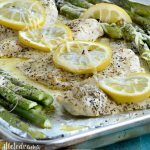 This easy Sheet Pan Dill Chicken Dinner with veggies is light, healthy, savory and ready to eat in just 30 minutes! You’ll love the easy clean-up, too! It’s been a little while since I shared a sheet pan dinner on the blog, but the holidays kind of took over. This particular chicken dinner is light, mostly healthy and can easily be made for gluten free and Whole 30 diets. So, why am I sharing this in the middle of comfort food season? 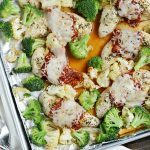 For starters, one sheet pan meals are super easy to make, and there’s hardly any cleaning up to do. I think I may have told you that our dishwasher broke down, so we’re all about easy dinners that don’t use a lot of pots and pans right now. And in the new year when we all want lose some holiday pounds and eat healthy, this will fit right in with my meal planning! I shared this easy dinner over at The Weary Chef last month, so now it’s time to post it here. This dinner is so simple to put together, and you can make more or even less to suit your own needs. I sliced some chicken breasts in half so that they would cook faster, and then I made a simple sauce of mayonnaise and dill to flavor the chicken. And let me you, the fresh dill makes your whole kitchen smell ah-MAY-zing. If you can’t find fresh dill, you can use dried, but please, please try to get the fresh! Just add some pre-cut baby carrots and fresh broccoli florettes, and you’re ready to make this dinner happen. Seriously, the prep work here is minimal, and after about 30 minutes, you are ready to eat! 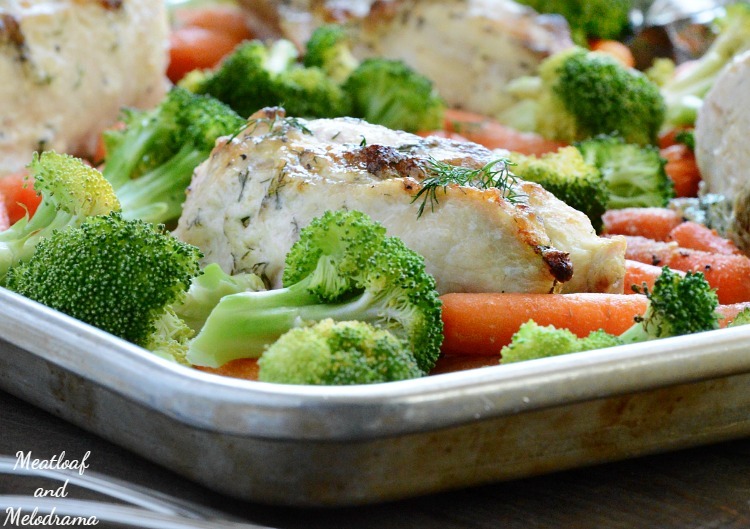 A light, quick, healthy 30 minute chicken dinner made on one sheet pan for easy clean up. Can easily be made to fit gluten-free and whole 30 diets. 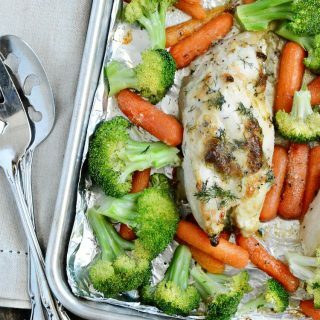 The other great thing about this sheet pan dill chicken dinner is that you can easily change the veggies to suit your own tastes. My kids love carrots and broccoli, but potatoes and Brussels sprouts would also work here. 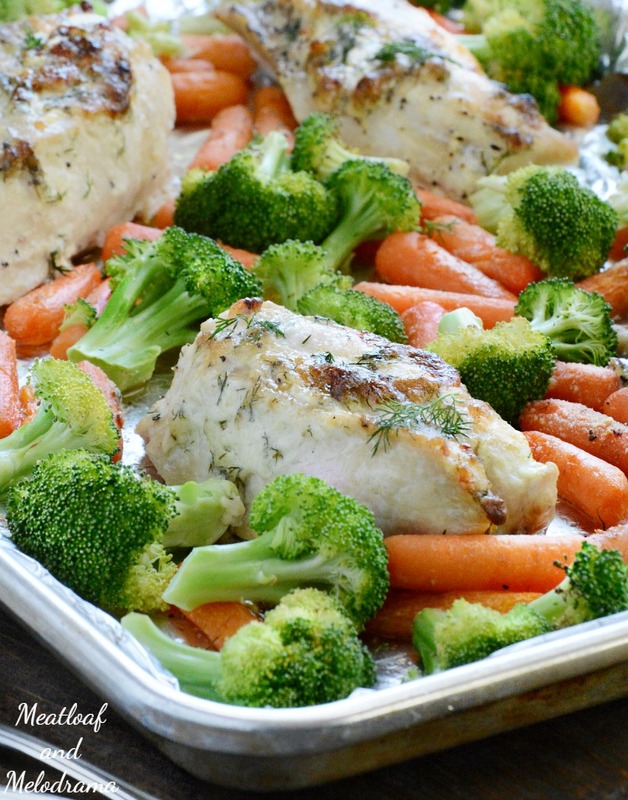 This looks so flavorful and I LOVE that it’s made all in one pan! 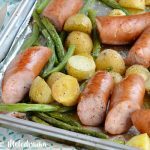 I have fallen in love with Sheet Pan dinners! They make busy weeknight so much easier! Exactly! I’m in love with them too! What a perfect weeknight dinner! Thanks, Jocelyn. 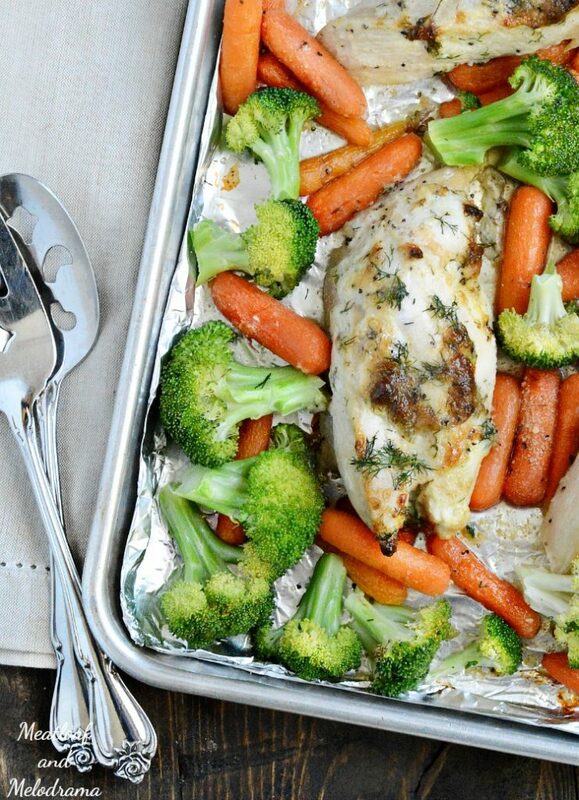 We love sheet pan dinners! I love how easy this looks to make. Perfect for busy nights! It’s super easy! We’re pretty much living on these right now. That chicken looks so moist and flavorful! I love recipes like this one where it’s one pan/pot and simple clean-up! I love how healthy this is as well! Dill is one of the most underused herbs, but I love the flavor. Great idea to add it to this chicken dish! I just love the Dill in this recipe! Hope you have a fantastic weekend and thanks so much for sharing with us at Full Plate Thursday! Do you think you could substitute Greek yogurt or creamer fraiche for the mayo to lighten it up a bit? Super excited to try this! Awesome! I do love me some mayo, but my Dad just had a stent put in, so I’m trying for healthier.